No Doubt Obvious to Pet Owners… | Comics I Don't Understand - This site is now being updated daily at http://www.comicsidontunderstand.com. Please change your bookmark if necessary, and notify any web site with a link to the old address. The style looks Larsonesque, but the humor is a bit lowbrow even for him. Don’t think it’s a genuine Far Side, though the influence is clear. The chickens emerge wearing collars of the sort veterenarians often put onto dogs who’ve just been neutered to prevent them from chewing their sutures. But it’s not a great joke, and the sign really threw me off, why bother writing something that obvious if it doesn’t matter? The paper sign is an awkward way of telling you this is the back door, not the front door. This is from The Argyle Sweater by Scott Hilburn. He can be very Larsonesque at times, and more often than not I find him funny. I don’t have an explanation for this one though because if I didn’t actually send it in — I wanted to . Leahy’s got it. The deliveries of nuggets involve surgery and the inevitable cones that follow for pets. The thing I can’t understand is why they seem to be neutering only roosters born without eyeballs. I just heard that Milli Vanilli was arrested for impersonating a McNugget. HOY-YOOOOO! This one has me stumped. It appears to me that they are being denied access at the back door…the one is getting unceremoniously booted out and one of the others is slumped on the wall and doesn’t seem to know what to do. If they are removing “nuggets”, internal or external, where is the sign of it…stitches, blood? Maybe if they were storks making deliveries? Nope. Makes no sense to me. Do the cartoonists ever show up here with explanations? Lola, it’s always been CIDU policy not to accept explanations from cartoonists, under the theory that they already had the chance to make their meaning clear — though I guess that policy would be a bit hard to enforce now that there’s no moderation. What freaks me out is that there appears to be some chicken feet sticking out from under the garbage can lid. What’s THAT all about?? Of course they are removing the chicken’s nuggets (ie, balls). He is taking a little liberty in implying that the nuggets are on the outsideof the animal-hence no stitches. 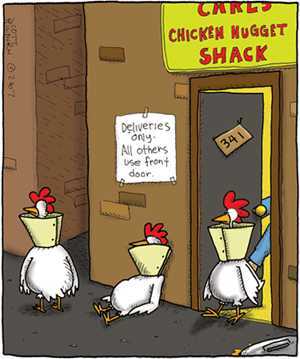 And it is the backdoor for deliveries because the chickens are delivering their nuggets! They have the cones on because when your dog gets neutered, it wears a cone. I LOVE The Argyle Sweater! Didn’t your site used to say something like “if you have any idea what the meaning is, especially if you’re the cartoonist?” Or was it, “unless you’re the cartoonist”? Rob, if there’s one site where that can be forgiven, it’s this one. maybe the sign should have read ‘chiken balls’? I stumbled across this in a search. The chickens are wearing killing cones. Google it and then the comic will make sense. No Doubt Obvious to Pet Owners… | Comics I Don’t Understand – This site is now being updated daily at http://www.comicsidontunderstand.com. Please change your bookmark if necessary, and notify any web site with a link to the old address.